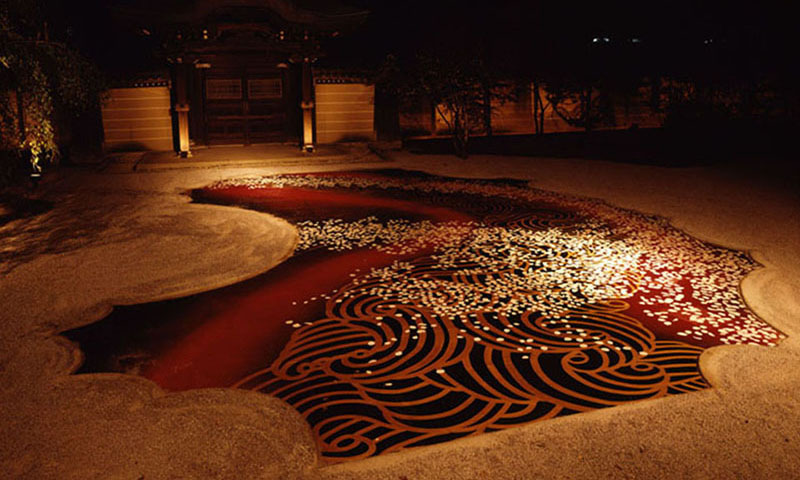 commissioned for Kodaiji temple in 1998. I've been fortunate to have had a chance to work with Kyoto's prominent Kodaiji temple since 1997 when I held an art event. Using a 100-year-old cherry tree at the temple as my model, I created a 1570 square foot picture in a garden. It was my biggest accomplishment of self expression while I had a real sense of achievement beyond description. A picture entitled “Weeping cherry tree” on a sliding paper door (fusumae) at Kodaiji temple I depicted in 1998 has become my masterpiece. The Fusumae has been on public display every spring in the temple's main building. Rimpa is a format or sensibility passed down since the 17th century. The aesthetic of Japanese highly decorative arts has been handed on largely by artists of the Rimpa school, known for the integration of Kyoto's refinement and stylish culture of Edo (Tokyo). Originated in bold conformity of classical themes by Hon'ami Kôetsu and Tawaraya Sôtatsu in the Momoyama period (1573-1615) to early in the Edo period (1603-1868), Rimpa flourished when Ogata Korin, its best known figure, gave it a strong sense of design in the mid Edo period (1603-1868). Sakai Hoitsu and Suzuki Kiitsu inherited and developed it in latter half of the Edo period. Using gold and silver leaf, Rimpa's seminal paintings evoke a novel sense of design. The form and design presentation of folding screens and artifacts of Rimpa are considered to be created as decorative arts to enrich people's lives. Prior to the Edo period (1603-1868), there was no such a concept of "painter" in Japan. Professionals of painting were regarded as artisans called "Eshi". They were anonymous craftsmen whose products intended to satisfy the demands of clients at that time. From the Meiji period (1868-1912) and onward, "Eshi" achieved recognition as a painter. © SENRIN - All Rights Reserved.